Though Omaha is not known nationally for its architecture or built environment, new construction on both fronts appear to be booming, especially within the I480 corridor. Consider such recent developments as The Corvina, Hyatt Place, The Highline 2100, L14 Flat Apartments, The Even Hotel, Gavilon, and Avanti Townhomes. Perhaps now is an opportune time for a rigorous discourse about Omaha’s architecture and a re-evaluation of the built environment before all the vacant lots are filled, historically registered buildings are leveled and more building permits get filed with the city. One might begin with a renewed appreciation for certain examples of exceptional architecture, often hidden in plain sight, which collectively challenge these newer building tendencies and aesthetics. The following six structures are worthy of a second (or first) look. They sit in staunch opposition to the mix-and-match material design happening in and near Omaha’s cultural districts. Through an opinionated evaluation of each building, observations about focused material use and pragmatic design coalesce into precedents for architecture in Omaha. Atop the Howard Street hill near the downtown YMCA a cloud factory is hard at work. Pumping ephemeral vapor into the sky since 1968, the NRG Energy Center Omaha is a perforated concrete envelope juxtaposing brutalist tendencies with an effervescent mist. It is a simple mineral-grey, seven-story structure with a complex interior and use. Billowing 24/7, it is hard to ignore this building’s similarities to another misty pavilion by starchitects Diller Scofidio. Their temporary Blur Building was situated near the base of Lake Neuchatel in Yverdon-les-Bains, Switzerland for the Swiss EXPO 2002. Scofidio explains that the Blur Building was “an architecture of atmosphere. Water was not only site and primary material of the building; it is also a culinary pleasure. The public could drink the building.” Architecture-speak aside, both cloud-like buildings move beyond their infrastructure and exoskeletons, being informed by their environments and contexts. As the seasons pass, the building’s silhoutte shrinks and swells, sometimes extending hundreds of feet in the air as the man-made fog condenses into the atmosphere with poetic material restraint. Nearly hidden amongst a complex of ecclesiastical structures, the Saint Peter Cathedral Convent is a rectilinear-gridded building taking cues from Case Study homes of the 1950’s and compact modern masterpieces. Stout in form, this two-story building is now the home to the Seraphic Sisters of Omaha. Form follows function in that the assumed austere lifestyle of the nuns is reflected in a consolidated material palette of taupe bricks and unfinished concrete structural support. However, unique detailing punctuates the east and west façades with a hop-scotch window pattern and a sea of vert. Completed in 1958, the fireproof building has the capacity to house 11 nuns and includes a sewing room, “two huge parlors,” and chapel. At the end of a long interior promenade hallway, the chapel is the most awe-inspiring room in the convent. With a stair-cased ceiling and tiny primary colored stained glass windows, the compact space sits in corollary solace to the rest of the micro-domestic spaces. The Saint Peter Cathedral Convent is a secret oasis. Now 58 years later, the nunnery stands as a prime example of restrained architecture in Omaha. Color can make or break an architectural project. Take the Hyatt Place in downtown Omaha, whose peculiar beige and brown combination could make even the least design-oriented individual cringe. 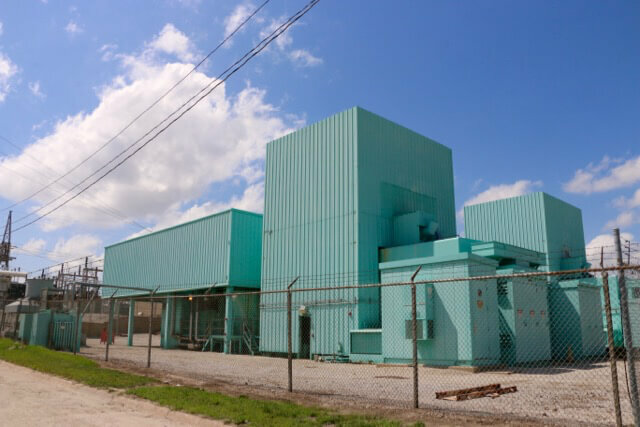 The OPPD Powerhouse on the other hand, is a group of small industrial steel structures painted a vibrant aqua. The all-over color unifies the structures. Coincidentally, according to a source at the city, there does not appear to be any building codes or direct reasoning behind the color choice. Elevated on eight thin pillars, the two-story window-less structures are the approximate size of either a shipping container or semi-truck trailer. The composite of buildings take cues from other modernist buildings and theories — literally breaking down a box into its most simplistic forms. Reminiscent of Bernard Tschumi’s Parc de la Villette follies (although not the iconic red), the abstract group of buildings sits in almost complete contrast to its surroundings. The site is raw and post-apocalyptic. Next to a CrossFit gym, a dirt road, a patch of untamed wilderness, and other former industrial buildings, these aqua spaceships are dramatically ready for a Stanley Kubrick film. The powerhouse’s shape — while rigid and industrial — continues to be secretive and unclear. In serene opposition to fit in, this space should be a case study for the role of color in architecture in Omaha. It is unsurprising that Omaha’s car-centric driving obsession would result in at least a few exceptional parking structures. South of the Orpheum Theater is a tiramisu delight owned by Webster Real Estate. Two stacked sponge cake layers create a gridded, Tetris-like form not unlike the Saint Peter Cathedral Convent. Amazingly paired down and verging on hyper-austere, the City Lots parking garage consumes the Southwest corner of 16th and Howard. Abstracting the obnoxiously postmodern OPPD headquarters across the street, the structure is constructed solely of cast concrete. Looking east, there is an exquisite push and pull of 40 equally shaped voids/fills. There is only truth in the building; truth in form, truth in weight, truth in materiality. With an ornately Baroque theater next door, this simple parking garage gives Omaha’s auto-addiction its fix with a no-nonsense approach to design and an economy of structural satisfaction. Can you see a building with no windows? The Northwestern Bell building located at the corner of 20th and Douglas is certainly pushing that proposition. The monolith is intentionally crazy-severe. Designed to securely house the company’s main Omaha switching sytsem in a stormproof edifice, from street level to the sky there is nothing but a buffet of brick curtain walls. Striated in presumably Illuminati binary code, thin stacks of dark burgundy bricks stripe the otherwise sandy-red building, which pushes sixteen-stories into the Omaha skyline. Until the Woodman Tower was finalized in 1969, the Northwestern Bell building was the tallest building in Omaha, antenna included. Residing somewhere between postmodern and dystopian, this bi-colored structure purposefully does not give much away, yet through its singular material focus provides an architectural respite between the Old Market brickscapes and Blackstone mishmash. Ignoring context, the building allows its function to supersede with a characteristically omnipresent pattern. Even with a new CenturyLink logo perched at the top, the Northwestern Bell Building proves that dual color and simplistic, yet overall, patterns and forms do not explicitly need to result in material confusion. Marooned on a double city block is a blue stone fortress built in 1986. The 113,000-square-foot Omaha Branch of the Federal Reserve Bank of Kansas City is a bunker plunked amongst a strategic sloping site. In 1986 it was hailed by then-Mayor Boyle as “an important [architectural] asset for the city,” and it was recognized by the Omaha Women’s Chamber of Commerce as one of ten projects that make Omaha a more beautiful city. A singular material choice blankets everything with an extreme, albeit hefty, minimalist ethos. While massive, the Federal Reserve Bank is also “not there.” It is a chunky architectural ghost, one that is easy to walk or drive by without notice. In conclusion, this is not a conclusion. Architecture is not a passive ingredient to the city-scape of Omaha, and it should not be treated as such. Haphazard approaches to design only re-enforce contemporary anxieties about space and policymaking. Omaha deserves a more thoughrtfully considered built environment. Yet, with Pokémon Go Trainers now traversing Omaha re-discovering their built environment, a renewed appreciation and expectation for the architecture should be right around the corner. Omaha has a lot to appreciate architecturally. Sometimes it is simply hidden in plain sight. ‘Nebraska Rising’Can Mew Dig It?